I think this is my favorite photo of the two of them. Oh gosh…I can see how it would be. Even though sometimes I know it must be hard to look at the pictures and hear the messages, I’m glad for you that you have them. I know they are treasures. This is a FANTASTIC photo of Maddie and Jackie! I love when people are truly happy and smiling with their eyes…. and you can see the happiness in this picture! Love love love this! And now they are together again, smiling at you and Mike xoxo Love this picture – pure love. what’s the saying a picture is worth a thousand words. I don’t know you or Jackie but this picture and your words pull at my heartstrings. Beautiful on so many levels. What a great moment. Love that you were able to capture it. This is just a breathtakingly beautiful photo of the two of them. Thank you for sharing it with us. This is gorgeous. You know Jackie! is giving some major cuddles to Maddie right now. Your angels. Gosh, it certainly is lovely! I can see why it would be one of your favourites! You’ve got an angel taking care of your little angel now. I’m so glad you have this wonderful memory of two special people in your life. I can totally understand why this is your favorite photo – 2 beautiful girls. Take care. Beautiful picture, beautiful smiles. You all are so blessed to have had such amazing people in your lives, even for such an incredibly, heart-breakingly short time. Thank you for letting the rest of us experience the joy these two brought to you and your family. And this is how you can imagine them now. Because that is probably just what they are doing. Until your post with Jackie’s obit today I’d only been thinking about how you’d lost both of them. It hadn’t occured to me that they were together again. Nothing can relieve the pain of losing them both. But perhaps there is a slight balm in knowing that they are back together. I hope that thought brings you peace. I can totally see them like this up in Heaven. I am sure Maddie welcomed Jackie with open arms. I am so sorry for your loss. Thank you for sharing the tribute from Jackie’s family. It made me cry. What little bit you can see of both of their faces, you can TOTALLY see the love reflected off of those two! Ahhh…they are true BFFs! What a treasure – that picture is pure joy and love. Thank you for sharing it with us. Took the words out of my mouth, Bren. 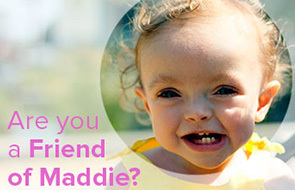 The connection between Jackie and Maddie is so tangible in that picture. Great, great photo. Love, peace and comfort to all of you. I imagine your happy (as you possibly can be) that Jackie and Maddie are reunited. So sorry for your loss of your beautiful friend. I don’t know what you believe…but I believe they are sharing this same pose up in the heavens right this instant. What a great photo. I’m terribly sorry for your loss. I absolutely LOVE this picture of Maddie & Jackie!